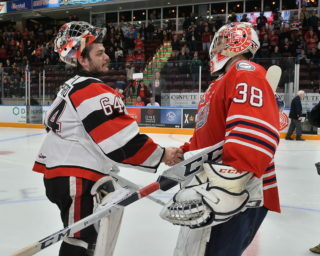 A big third period powered the Oshawa Generals to victory from the comforts of home as they defeated the Niagara IceDogs 4-1 in Game 3 of their second round series. The Gennies struck for two goals in a span of seven seconds, a pair of markers separated by a lengthy review. Kyle Bollers (1) crashed the net for the game winner 2:40 into the third period before Serron Noel (2, 3) barrelled into the slot for his second of the night at 2:47. Brett Neumann (4) would add a power play marker to give the Generals new life in the series as they outshot Niagara 35-29 and 2-for-4 on the power play. 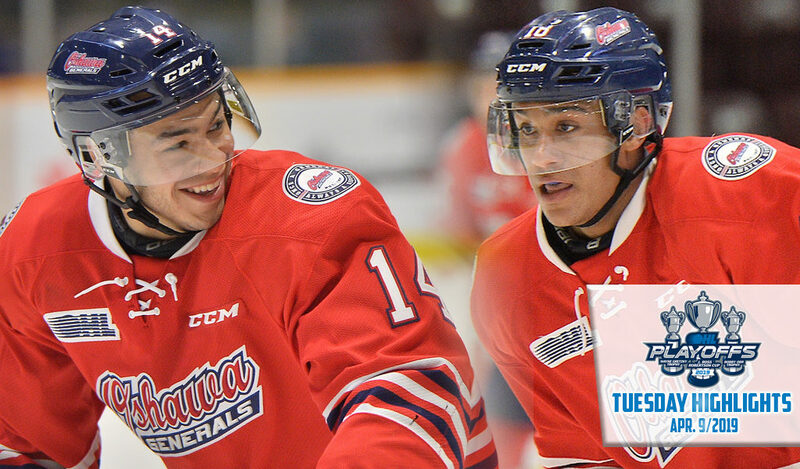 Brandon Saigeon and Giovanni Vallati each picked up two assists for Oshawa while goaltender Kyle Keyser stopped 28 of 29. Jason Robertson (6) provided Niagara’s lone goal on a beautiful effort 6:27 into the second period. The Generals win came before a Tuesday night crowd of 3,680. Game 4 of the series goes Thursday night back in Oshawa. The Soo Greyhounds showed early life, rebounding from a 10-1 drubbing in Saginaw on Sunday with three goals in the opening 10 minutes of action. 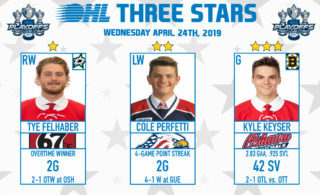 The early momentum wouldn’t hold however as a red hot Saginaw Spirit squad charged back to victory, taking a 3-0 series lead with a 7-5 comeback decision on the road in Game 3. Cole Perfetti (3) took a friendly bounce off the glass to score the game winner with 6:06 remaining in the third period as the Spirit are one win away from their first ever appearance in the Western Conference Championship Series. Morgan Frost (4), Barrett Hayton (5) and Jaromir Pytlik (4) spotted the Greyhounds a 3-0 lead, getting the 4,074 in Sault Ste. Marie up onto their feet. NHL Draft prospect Joe Carroll (1, 2) would also score twice but Saginaw took over as the game progressed, scoring seven times on 26 shots. Cole Coskey (1), DJ Busdeker (2), Bode Wilde (4), Brady Gilmour (2), Camaryn Baber (3) and Owen Tippett (9) joined Perfetti in the goal-scoring department while Blade Jenkins picked up a pair of assists. 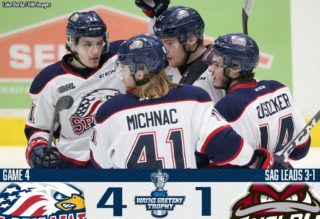 Ivan Prosvetov made 34 saves for the win in the Saginaw goal as the Spirit are in a position to close out the series on Thursday night back in Sault Ste. Marie for Game 4. The Sudbury Community Arena hosted its first second round playoff action since 2013 and it would be a high-scoring affair, with the visiting Ottawa 67’s coming out on top 8-5. A back-and-forth game saw Ottawa wrestle away control late in the second period, scoring a pair to go up 5-3 before Jack Quinn (2) and Tye Felhaber (5) put things out of reach in the opening half of the third frame. 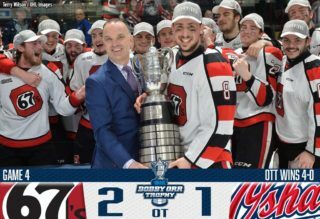 Lucas Chiodo (6), Lucas Peric (1), Sasha Chmelevski (3) and Kyle Maksimovich (3, 4) also scored for the 67’s as they outshot the Wolves 41-26 and took a 3-0 series lead. Chiodo and Chmelevski each had a goal and two assists on the night while blueliner Hudson Wilson picked up three helpers. Shane Bulitka (2), Owen Gilhula (2) and Macauley Carson (2) scored goals in the opening half of the game as the Wolves were tied 3-3 with Ottawa at the midway point. Adam Ruzicka (2) and Jack Thompson (1) would also tally in front of Ukko-Pekka Luukkonen who made 33 saves in the loss. Sudbury’s power play went 2-for-5 while holding Ottawa to 0-for-4 on the night. The game was played before a Sudbury crowd of 3,749. The 67’s look to close things out in Game 4 on Thursday night.